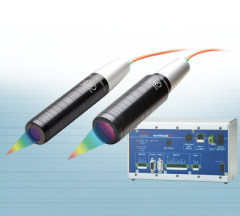 Photoelectric sensors use light to sense the presence, absence, or distance of target objects. They consist of an emitter light source, a photodiode or phototransistor receiver, and supporting electronics. Photoelectric sensors can be categorized into various types based on how the device components are incorporated. Through beam (or opposed mode) sensors incorporate a transmitter and a receiver on opposite sides of the target and evaluate absence or presence based on transmittance or blockage (respectively) of the beam. They have the largest sensing range but can be complex to install. Retro-reflective sensors incorporate the emitter and detector in one body with parallel beams; a reflector opposite the target path is used to reflect the emitted beam back to the detector. Presence is detected when the reflected beam is interrupted by an opaque object. These sensors are easy to install but have a small sensing range. Proximity or diffuse (use the target as the "reflector") sensors incorporate the emitter and receiver packaged together. Presence is detected when any portion of the diffuse reflected signal bounces back from the detected object. Reflective properties of the target must be evaluated for correct placement, as these sensors can be affected by target material and surface properties. Diffuse sensors may be normal, divergent, convergent, fixed-field, or adjustable-field. Divergent sensors are short-range diffuse-type sensors without any collimating lenses. This makes the presentation angle of the target less critical. This is important for mirror-like or specular objects, where a collimated beam from a standard diffuse sensor may reflect off a non-parallel surface and may thus not be detected. This type can also be used for short-range sensing of targets with small profiles such as wire or yarn. Convergent sensors are used to focus the emitter beam at a fixed distance from the sensor. This allows for good sensitivity but limited depth of detection. The high sensitivity of this style makes it suitable for uses such as detection of transparent objects. Fixed-field sensors are designed to have a distance limit beyond which they will not detect objects, no matter how reflective. Sensor output is canceled when light detection by one detector surpasses the other. The field distance is typically factory set per application specifications. Adjustable-field sensors utilize a cutoff distance beyond which a target will not be detected, even if it is more reflective than the target. The ratio of two current outputs determines the cutoff distance and is readily adjustable, electronically or with a manual adjustment such as a potentiometer. Photoelectric sensors have a number of important specifications used to describe performance. Detecting range is the range of sensor detection, which is based on the maximum distance for which the signal is stable. The position measurement "window" determines the width of the linear region of the sensor. A sensor which measures between 14 and 24 cm has a window of 10 cm. Response time indicates the time delay between the object entering the detection zone and the production of the detection signal. Features for photoelectric sensors may be important to consider based on the application. Retro-reflective sensors may be polarized to minimize false reflections. Beams may be visible or invisible. Invisible beams are important for manufacturing applications where visible beams could be distracting to workers on the floor (and thus dangerous), and also for products used in security systems. Light may be supplied by glass or plastic fiber cables. AC, DC, or analog outputs are available. Sensors can be packaged as a raw element or a housed transducer. Self-contained instruments or meters display output at or near the device. Gauges/indicators have an analog display and no electronic output. Devices may have various ratings such as operating temperature, vibration ratings, and shock ratings which determine the environments in which the sensor can safely and effectively perform. Photoelectric sensors are employed in aerospace, health care, metal fabrication, packaging, warehousing, paper, transportation, and other industries. Capacitive linear position sensors are devices that sense position / displacement using capacitance technology. Eddy current linear encoders detect the distance from a target by using magnetic fields generated by a reference and sensing coils. Optical linear encoders use fiber optic technology to sense position and displacement. Optical triangulation position sensors use reflected waves to pinpoint position and displacement. The source of these waves may be a light emitting diode (LED), infrared (IR) light, or laser. String Potentiometers are used to measure the movement and displacement of objects. A cable or wire is attached to an object, and as the object moves, the transducer produces an electrical signal proportional to the wire's linear extension. Ultrasonic linear position sensors and switches use ultrasonic waves in combination with light and frequency readings for position and displacement sensing.